← Planned Repair of the Lambeth Walk Murals! Yes a little late but as I say better late than never! So last year was as jam packed as 2012. So let’s take a look at what happened! 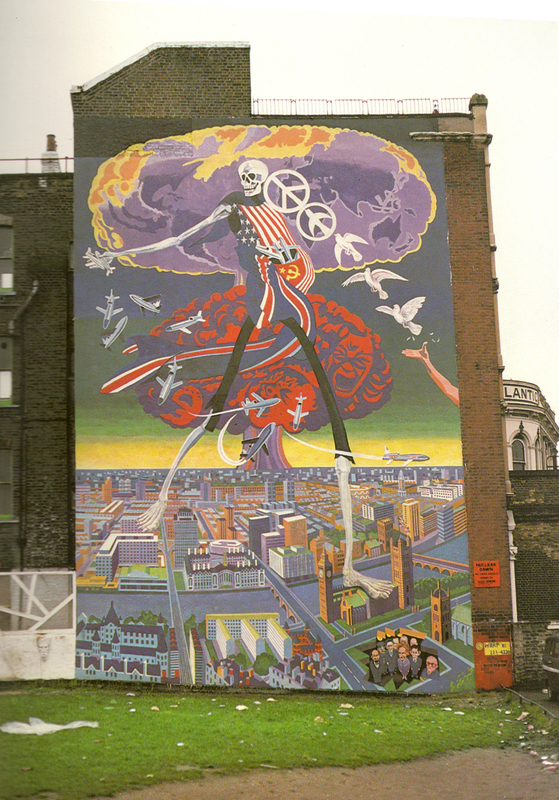 The beginning of the year was met with concerns about the preservation of the Nuclear Dawn Mural on Coldharbour Lane in Brixton. The mural is situated on the side of Carlton Mansion which will be repaired for use as part of the Somerleyton Road development. The car park next to the mural will be the new home for the Oval House Theatre. 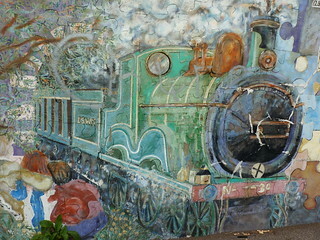 It is part of the site’s brief that Lambeth would like to retain the mural. Although they are keen to keep it, the language of the Lambeth’s proposal has always been loose and makes no promise that the repair and retention of the mural is a definite. 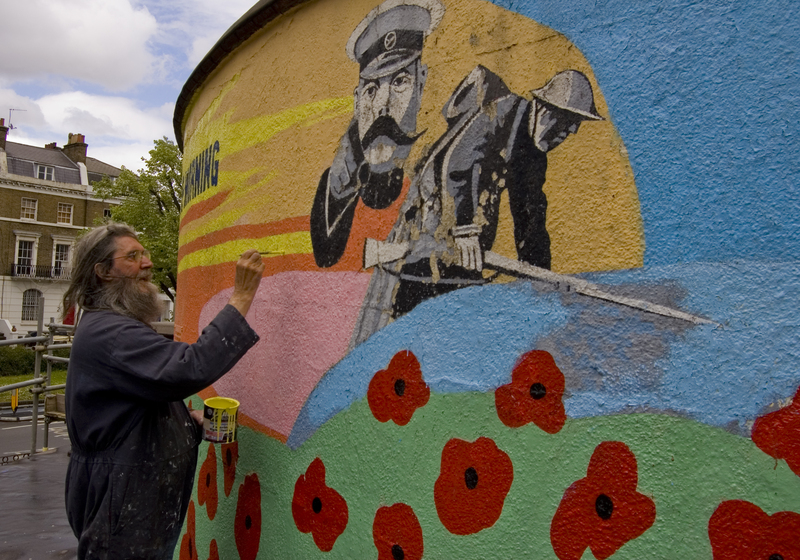 With this in mind, the LMPS decided to create a petition to show local public support, something that was felt key to deciding whether the mural is preserved, and an application for listing was also handed to English Heritage who are still thinking about listing it. The proposal was supported by the Centre for British Archaeology and the 20th Century Society. The petition attracted over 1000 signatures and can be found here. While we wait for decisions to be made, the condition of the mural is getting worst. Let’s hope a clear action plan is developed. 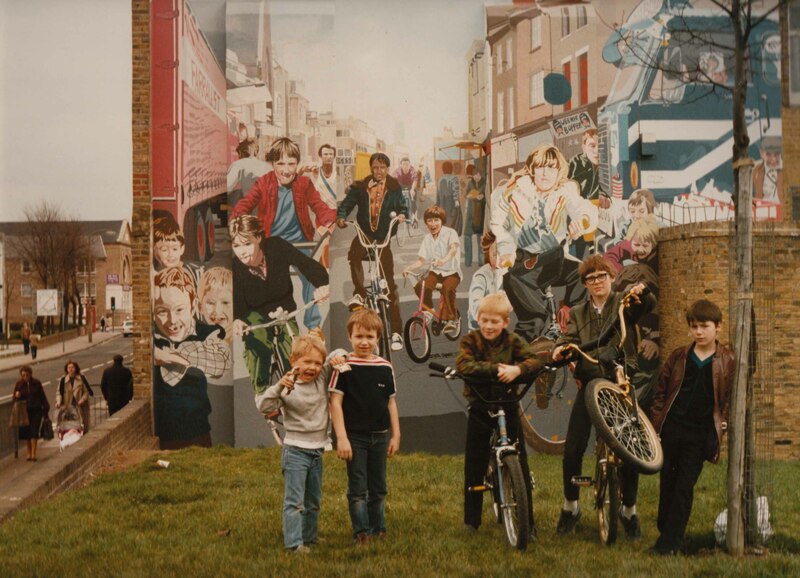 In the summer, it came to our attention that a planning application had been put in to demolish half of the Mauleverer Road mural to create a row of houses. This was campaigned against with the help of original artist Jane Gifford, Mick Harrison and Caroline Thorp, local residents, Nicky Bradbury, Charlie Ward, Keiran, Vivienne and the Brixton Society. An article in the South London Press, the Brixton Bugle and the Brixton Buzz hi-lighted the situation and the planning application was thoughtfully opposed. Lambeth planners recognised this and refused planning permission. The site developers put in an appeal which was heard in 2014. Unfortunately, the developers won and we await to hear when demolition starts. 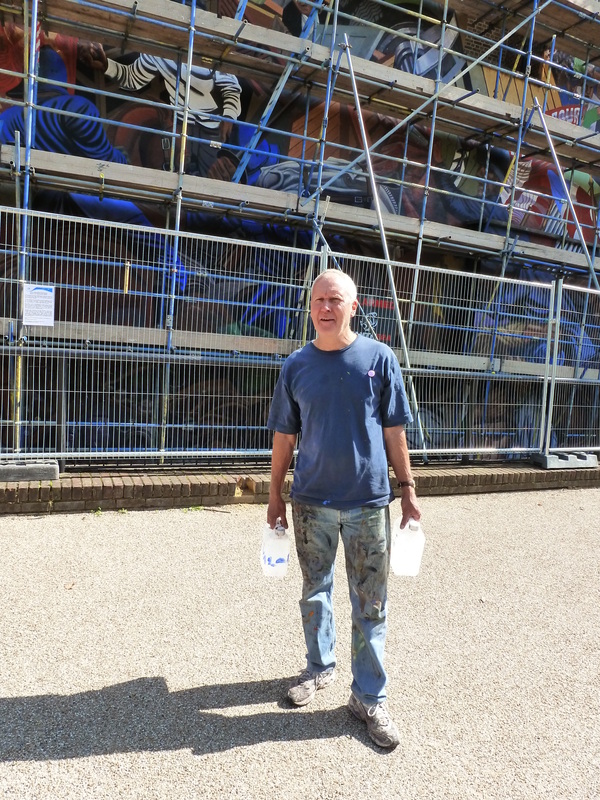 A decision was made by Hackney Council to get the Hackney Peace Carnival Mural repaired. Hirst conservation and Paul Butler are currently working on the repair. Although this is great news for the mural, the lack of local community involvement exploring the heritage of the mural and encouraging local care of the piece is likely to mean that the graffiti at the bottom will continue to grow. 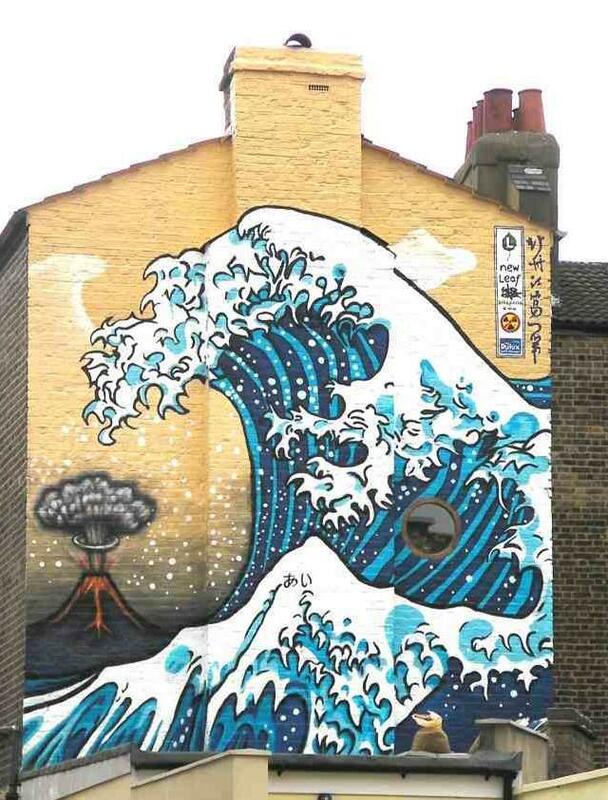 Damaged in 2012, a plan was hatched to repair the Great Wave Mural in Camberwell. A dedicated team led by Vinnie O’Connell from New Leaf, braved the cold weather to repair and repaint the piece, returning it to it’s former glory. Dulux donated the paint and many artists gave their time. Repairing the mural at Stockwell took up much of the summer. After some discussion with Lambeth and a plan and budget put forward, we were given the go ahead to repair the mural with the assistance of the Friends of Stockwell Memorial (FSM). Artist Brian Barnes was employed along with artist Morganico to do the repair work. The initial start of the project was delayed due to wintery weather. Once it was warm, the surface was repaired, holes filled, walls cleans and flaking paint removed. This did mean that vast areas had to be taken away as the paint was about to fall away from the mural. Much of this work was done by the volunteers. A scaffold was erected to repair the higher parts of the mural and construct a safe place to work from. Several different volunteer painting days were held as the artists continued to work on the highest part of the mural. Volunteers continued to spend their weekends working on the mural. A date was set for an opening, which was organised, along with a plaque, by the LMPS and FSM. 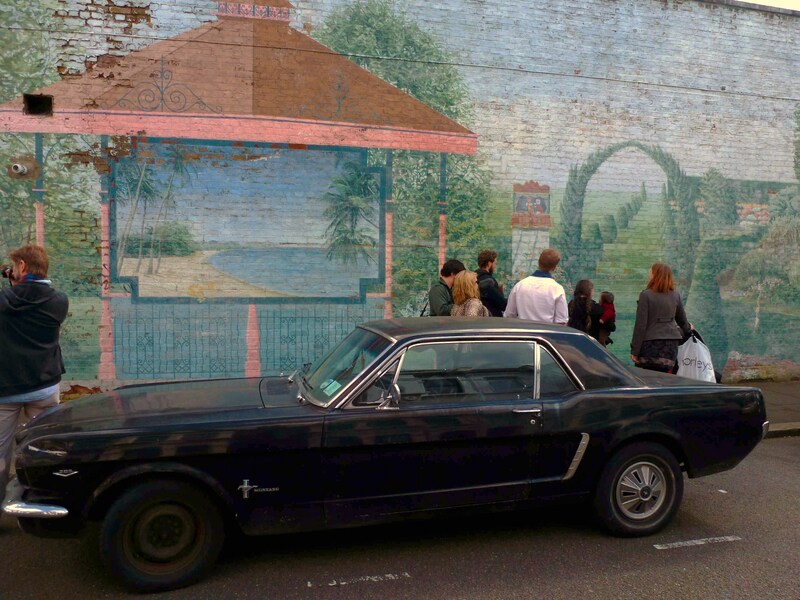 Two Brixton Mural walks were carried out in 2013. One was part of the Lambeth Local History forum walks which appears as on a leaflet available in local libraries and handed out by local societies. The other walk was part of the Lambeth Heritage Festival. Both were very well attend though we were also lucky enough to have good weather. Crossing the Red Sea when it was originally painted. 2013 witnessed the end of the Battersea puzzle mural, Plough Road, Battersea and the Crossing the Red Sea Mural on Old Ford Road, in East London. Both sites were marked for new development. This is the biggest threat to London’s remaining murals over the next few years. So, as you can see it was busy! So many murals to look after, so little time! A huge thank you to all those involved in 2013 : Ben, Gillian, Hannah, Hilary, Hilary, Sylvie, Reuben, Saskia, the Friends of Stockwell Memorial and Gardens especially Naomi, the many people who gave their time to repair Stockwell, Brian Barnes and Morganico, Brixton Society especially Vivienne and Bill, Jane Gifford, Caroline Thorp and Mick Harrison, Nicky Bradbury, Keiran and Charlie. If you are interested in becoming a volunteer to help record the murals, save the murals, find the murals, promote the murals and anything else, then please get in touch. This entry was posted in London Mural Preservation Society, Restoration and tagged Battersea Puzzle Mural, Brian Barnes, London, London Mural Preservation Society, Mauleverer Road Mural, Mural, Nuclear Dawn Mural, Paul Butler, Stockwell Memorial Mural, The Great Wave Mural. Bookmark the permalink.